Nassim Nicholas Taleb recently tweeted out an interesting problem. I didn’t know how to solve it mathematically, so I wanted to build a simulation in R.
PROBABILITY QUIZ: How randomness should almost never look random. I like to visualize things, so I decided to simulate throwing 8 darts on a board first, then simulate the dart throwing model many times using the Monte Carlo method. This uses the raster and tidyverse packages1. The raster package simulate throwing darts, while the tidyverse gives us flexible ways to filter the data we’re generating. We need to generate an extent from our dart board raster. This forms a bounding box around our dart board raster, so we can calculate coordinates within the extent that map to the raster. To generate a spatial sample, we pass in our dart board extent2, the number of times we want to throw darts, and our method for throwing the darts, which is random. In this exampe, none of our grids were hit by 3 or more darts. Now that we can visualize hitting one dart board with 8 darts, we want to determine the likelihood of one of our grids getting hit by 3 or more darts, per Taleb’s challenge. We’re saving the results of the board after counting the darts in each grid to a table, instead of plotting them in R.
We’re evaluating whether or not there are 3 or more darts in any grid within the function and returning TRUE or FALSE depending on the results. The parameter raster needs to be passed in (we’ll use our board raster from earlier), as well as the number of throws, n_throws. We can run this function with throwDarts(board, 8). Now that we have the throwDarts function, all we need to do is run it many times and calculate the frequency of cases where it returns TRUE divided by the number of simulations. 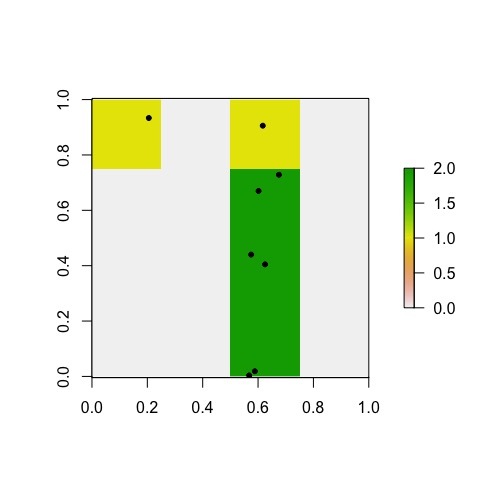 This will return an estimated average for how frequently 3 or more darts will hit the same grid during a simulation. The bulk of the work is done in the for loop, which runs through our throwDarts function as many times as we tell it to, storing the results in the boardEval vector. Since TRUE values equal 1 and FALSE values equal 0 in R, we can write a quick one-liner to add up all the boards that have TRUE values, then divide that by the number of boards we simulated. This gives us a frequency for how often boards have a grid with 3 or more darts! Running dartSims(board, 8, 100) will simulate throwing 8 darts at our dart board 100 times, returning the frequency of grids with 3 or more darts. However… this value isn’t likely the best answer! Running more simulations increases the likelihood of attaining a closer approximation of the true probability. This is where judgement needs to come into play, as increasing the number of simulations increases the time and computing power required. There are diminishing returns past a certain point, too, so starting smaller and increasing until things start to stabilize is a good approach. dartSims(board, 8, 100000) gives a good approximation given these tradeoffs with a value of 0.169125. Taleb tweeted out that the solution is 0.169057, so this is a fantastic estimation for our purposes. We covered a lot of ground, first building a visualization of throwing darts at a virtual dart board before abstracting the dart throwing into a function that we could use in a Monte Carlo simulation. While we didn’t answer Taleb’s question definitively, we did calculate a practical answer quickly. The Monte Carlo method is portable to similar problems, too. We sneakily implemented a technique that will work for geospatial problems, so keep an eye out for future write-ups along those lines (no pun intended). You can get the complete R script here.